After doing a list of Ten Girls’ Names from Medieval London, we decided that the boys could not be left out, so we checked through the records of the City of London for the 13th and 14th centuries, and found some very different names. 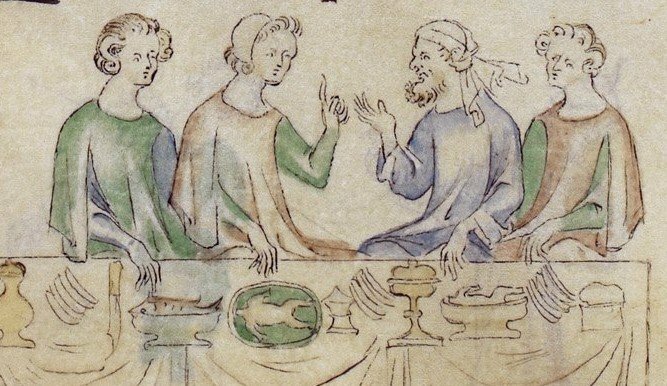 Nearly every male in medieval London seemed to be called Richard, William, John or Robert – just finding a Peter or a Walter seemed to be a relief. However, there are a few names that stood out – in some cases they might be names from Anglo-Norman times or are from men who came from overseas to live in London. In one case, the person got his name because of a clerk’s error. Hamo – Hamo de Chigwell, pepperer and then fishmonger, was the Mayor of London during the years 1319, 1321-1323, and 1327. Manekyn – In 1318 Manekyn le Heaumer was one of the two commanders, or Centurions as they were called, that lead a force of 100 Londoners to support Edward II in his campaigns in Scotland. Iter – Iter de Caumpes was the son of Richard de Caumpes. In 1310 he inherited a house on Walebrok Street along with his brother Thomas. We also know Iter had a son, but he went back to the traditional names and called him John. Drew – In 1370 Andrew Barentyn, a jeweller, became a citizen of London. However, the clerk who wrote his name “thought that ‘An’dreas’ was the proper Latin word” and made it into Drew. Years later he had the Mayors and Aldermen confirm that Andrew and Drew were the same person, and would continue to use Drew when he became an Alderman. Anketyn – Anketyn de Gysors was elected the Alderman of the Ward of Aldgate in 1311. His father was John de Gysors, who was Mayor of London at the time. Pentecost – In 1278 Pentecost le Gras and his daughter Margery tried to contest the will of his brother Stephen, who wanted to have all his properties sold off and the money distributed to the poor. They were unsuccessful. Ingelram – In 1285 Sir Ingelram de Hetrus, clerk, sold a shipment of wine to William Uggel, and the latter owed him 5 marks. Sewale – Sewale Hoddesdon was a fishmonger who owned or rented various properties in London in the late 14th century, including one on London Bridge. He is sometimes referred to as Sewall. Osmund – In 1308 Geoffrey de Osmund, mercer, instructed in his will that a chantry be set up for 5 years to say masses for the souls of his wife and his parents Osmund and Deonisia.